DRIP is more than a show — It's an explosive experience for adults 21+ that begins the minute you walk in the door and take a sip of blue beer. Held three nights a week, DRIP combines dance, lights, sand, water, paint and live rock music into an immersive show that engages and includes the audience. Dress Down — Wear jeans or old shorts, and either pre-order or purchase on-site a white DRIP T-shirt (you can wear one of your own, but white is recommended for the full effect). One you're there, a DRIP artist will be happy to cut it into any style you want. You will get messy (that sand, water and paint is going to be all over you). Before the show, you can decorate your shirts at the free pre-show painting area. And if paint gets on your skin or pants, don't worry. The latex-based paint easily washes out. Drink Up — The full-liquor bar is open before and after the show. Order a blue, orange, red or yellow beer; canned beer; glass of wine; or cocktail. There's also a free oxygen bar. Rock Out — The audience stands around the performance area for the 50-minute show, which features top-class dancers and musicians. Max is about 100 audience members, so you're guaranteed a great view. After the show, hang out at the bar and meet the performers. Tickets are available for purchase online. The venue also hosts private events, and special pricing is available for groups. Book a party at drip by emailing [email protected] or calling (347) 855-3747. Ranked in the Top 50 best attractions in Orlando, there is nothing like DRIP anywhere in Central Florida. Free valet parking at Senor Frogs is offered for DRIP audience members. 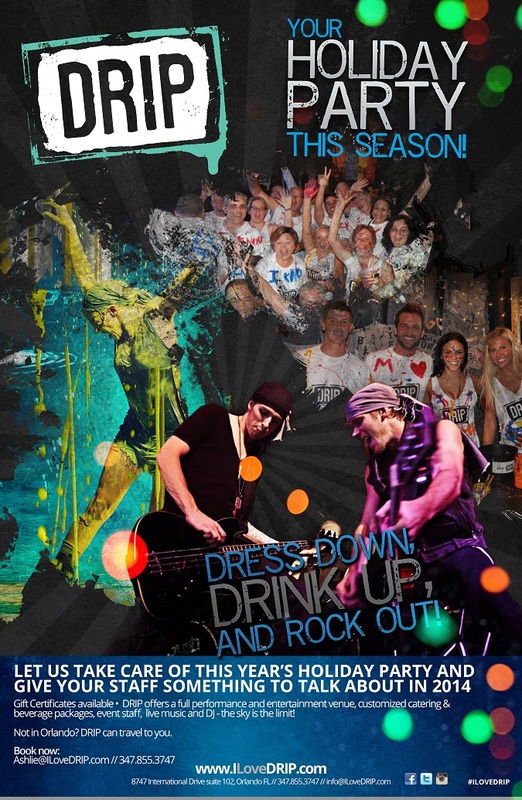 DRIP is located on International Drive, behind Senor Frogs and Denny's.